Kuhn Mines Ltd, railway(s) at Ma On Shan mine – any information needed! HF: Ma On Shan Iron Mine 1906-1976 – biggest mine in HK is one of the most read articles on the website. This is a sister piece about the company that is supposed to have supplied and/or operated an underground railway(s) at the mine. I said when I posted this article in May 2014 I could find nothing out about Kuhn Mines Ltd and I still can’t. Am I am searching in the wrong place? 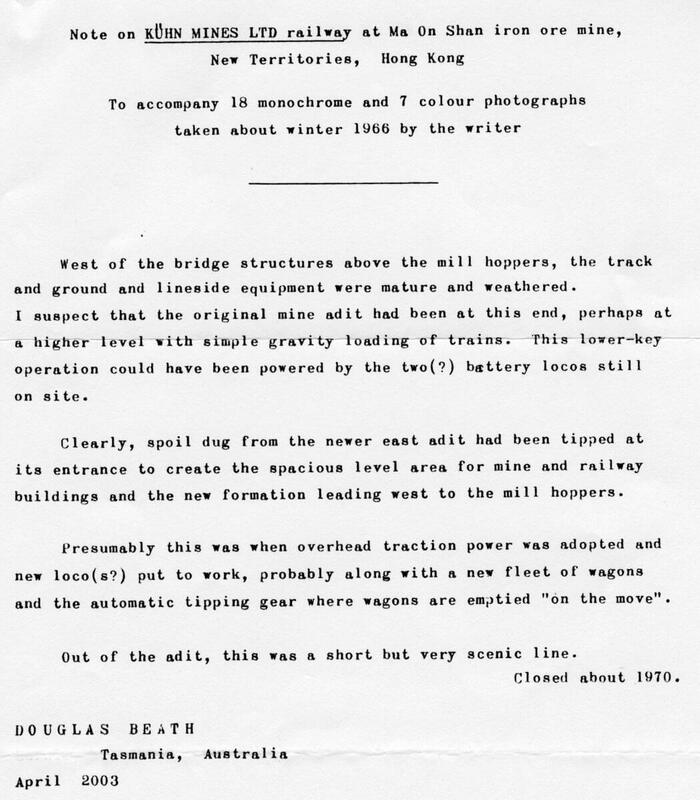 I have attempted to contact Douglas Beath, writer of the letter below, also without success. As can be seen by the comments below the main article. IDJ has sent the letter shown below. This links Ma On Shan iron mine with Kuhn Mines Ltd. 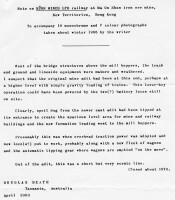 The writer Douglas Beath mentions 25 photographs taken in “about winter 1966”, which appear to have been lost after being sent to the Hong Kong Railway Society. The letter mentions two battery powered locos. And an overhead traction powered railway. All very intriguing. These two photos appear to show a railway powered by overhead cable at the mine. This article was first posted on 20th February 2015. Ma On Shan Iron Mine 1906-1976 – biggest HK mine? I tried the second one but the email address given is no longer working. I have emailed http://www.edinphoto... and await a response. The Hong Kong Railway Society doesn’t appear to be currently active. Can someone please correct me I’m wrong. Or if you are/were a member can you assist in our efforts to locate the Douglas Beath photographs? Peter Stubbs who runs the http://www.edinphoto.org.uk site wrote to me saying he hadn’t heard from Mr Beath for over a year and that the last time he did he was using the email address found in your second suggestion which appears to be no longer in use. I was watching the movie “The Sand Pebbles” with Steve McQueen. The San Pablo steamed up river and passed a huge sign on the mountain that said Kuhn Mines. Took a look on the internet and found this page. Anyway, really like watching these old movies. Never know what you will find!